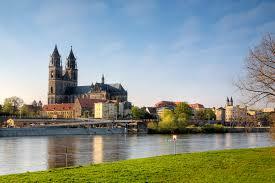 Magdeburg is the capital of the Saxony-Anhalt state of Germany. It is a lovely city located on the Elbe River. This city is more than 1200 years old. 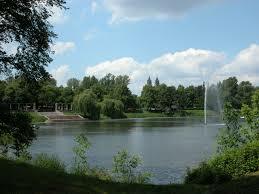 It has many historical sites, landmarks and beautiful green spaces. 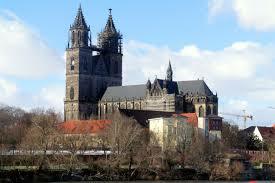 The first Gothic-style cathedral to be built on German soil is the Magdeburg Cathedral. 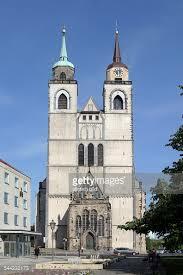 It is one of the largest church buildings in Germany and the most famous attraction in Magdeburg. Inside visitors can find artwork that represents almost all periods of art history. Some of the highlights include the original tomb of Emperor Otto I and his first wife Edith with Romanesque bronze grave markers, early Gothic sandstone sculptures among them the famous figures of the “Clever and Stupid Virgins”, the impressive carvings on the choir stalls of the canons that date back to the 14th century and Renaissance paintings. The Hundertwasser Building is a most amazing tourist attraction. 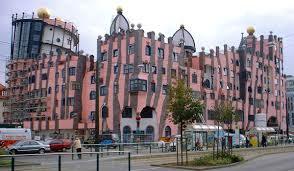 It is one of the last architectural masterpieces designed by Friedensreich Hundertwasser. The building has Baroque facades and for commercial and residential use. Known as the Green Citadel of Magdeburg it is located on the Breiter Weg in the heart of the metropolis on the Elbe River. A most colorful attraction this building features 55 apartments, courtyards that are open to the public and lots of shops, restaurants, cafes and a small hotel with 42 rooms. Elbauenpark stretches for 90 hectares and has been awarded the title of Germany’s second most attractive park in 2005. The park has a great vantage point at 40 meters and a sun lounger offering some stunning views over the park. It is home to the Millennium Tower, Lake Stage, Butterfly House and lots of other great features like playgrounds, sports areas, pieces of art and themed gardens. The park is also a great place for art lovers with interesting sculptures and pieces of art. For sports lovers there are different activities like the assault course, Frisbee disc golf course, skate park, sports area with an all-weather pitch and 25-metre-high climbing rock. During the summer one can participate in the 400 meter long toboggan run and in the winter ice skate on Angersee Lake. 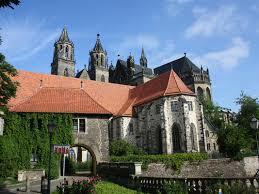 Considered to be the oldest surviving building in Magdeburg is the Monastery of Our Lady. The monastery has slender towers and is an impressive Romanesque building. The rotunda has pointing cones that resemble a monk’s tonsure and with its 32 arcades the rotunda forms an ensemble which is considered to be one of the most impressive and interesting structures in European monastery architecture. The church was vaulted in early Gothic style after 1220. Visitors can see a fine collection of sculptures that range from medieval to contemporary and are on display in the Art Museum of the Monastery. Presently the exhibition has paintings from the 15th to the 20th century, textiles, precious goblins from Flanders, furniture from various centuries and ceramics. A sculpture park was created in 1989. In the heart of the city at the Old Market visitors will find the Magdeburg Horseman, the bronze replica of the first free-standing equestrian statue found north of the Alps. 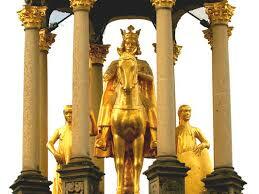 The statue depicts Emperor Otto the First flanked by two allegoric sculptures depicting maidservants. One maid holds a shield with the Imperial Eagle, the other a lance with a banner. Both are symbols of the imperial power. 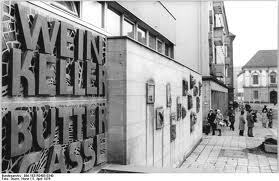 The original statue was moved to the Magdeburg Cultural History Museum in 1967. In the north-western corner of the market place is the impressive Buttergasse. At one time it was the lower floor of a medieval guild house and is one of the largest surviving profane buildings in Romanesque style to be found in Germany. Today it is a popular restaurant. 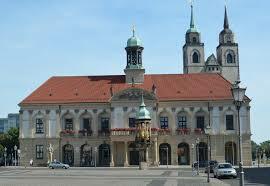 The Town Hall of Magdeburg dates back to the 12th and 13th century. 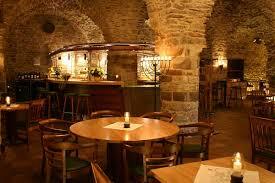 The oldest remains can be found in the vaults that form part of the Ratskeller Restaurant. In the old days pelt dressers, tanners and fell mongers met here to trade and stock their precious goods. The building was rebuilt in 1965. The bronze doors of the Town Hall were designed by Heinrich Apel and is carved with important historical figures. The amazing bell carillion has a range of four octaves and plays on market days and is used for concerts. 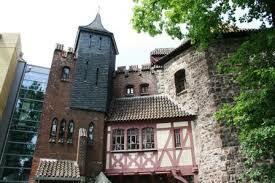 Dating from the 14th century the Lukasklause Building has an octagonal tower. Here visitors can see historic replicas, pictures and documents. There are live experiments that give visitors an insight into the life and work of Otto von Guericke. The Guericke Center was opened in 2010. The Welsche Turm has dominated the north-eastern corner since the 13th century. 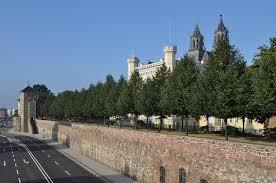 At one time it formed part of the city wall and secured the northern end of the Elbe River fortifications. The name Lukasklause was given to the tower by the “St. Lucas” art society which took over the building in 1900. Around this building is the best-preserved section of the old city wall. Today it hosts a permanent exhibition dedicated to the life and work of the famous scientist and Lord Mayor of Magdeburg. It is also a popular venue for cultural events, exhibitions and conferences. Magdeburg’s oldest parish church is St. John’s Church dating from 941. The Romanesque western section of the church and the Gothic hall have both been preserved. In the church is a monument Traces of Martin Luther and the family crypt of Otto von Guericke. In 1311 a three-nave and cross-shaped basilica was erected in the Romanesque style. Today the church is open to the public and has become a popular place for many different and unusual events. One of the most scenic German garden parks is The Stadtpark Rotehorn. It has been styled as an English park, created on an Elbe Island in the middle of the city. It has become a popular recreation area for residents. In the summer people can paddle around the Adolf-Mittag-See, relax in the beer garden and enjoy views of the lake. The park is great for strolling along the winding paths or participating in various sports activities. The Hegelstrasse Street begins at the Cathedral and runs in a southerly direction. 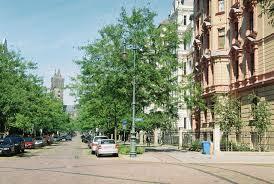 This popular boulevard was built between 1880 and 1920, during the Grunderzeit era. It is lined with many impressive buildings richly decorated and ornamented. The Furstenwall area dates back to the Middle Ages and contains city fortifications that face the Elbe River and two preserved fortified towers. It was built in 1725 and is the first public promenade in Germany. South of the Strombrucke, a pedestrian bridge leads to the Furstenwall promenade. The two fortified towers named “Hinter der Mollenvogtei” and “Kieg in die Koken” were already built in 1430 when the fortress was constructed. A masterpiece of engineering and made of steel and concrete is the Sternbrucke Bridge. 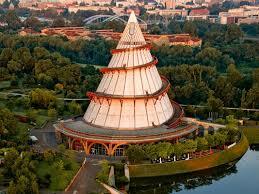 It is a part of Magdeburg’s identity and is the creation of famous German architect Bruno Taut. 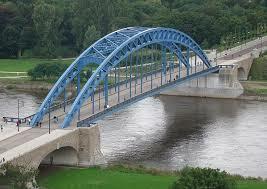 It was completed in 1922 and is one of the most modern bridges in Germany. After being destroyed in WW II the bridge was reconstructed and on May 1, 2005 it was officially opened to the public the same year that Magdeburg celebrated its 1200th birthday. The Gruson-Gewachshauser is a collection of greenhouses that are home to a traditional botanical garden featuring an exotic collection of plants kept by the industrialist Herrmann Gruson. 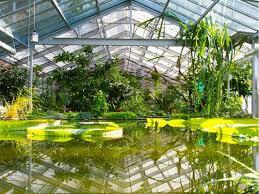 There are over 3000 exotic plant species and varieties cultivated in the nine public greenhouses. 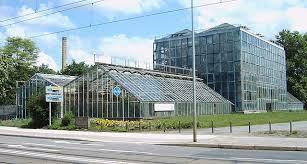 Each of the greenhouses is dedicated to a certain family of plants or a tropical or subtropical region. These greenhouses are also home to animals like piranhas, Malwi cichlids, poison dart frogs and turtles. The tallest greenhouse is The Palm House and the Treetop Trail lets visitors explore the crowns of these trees. In the Fern House are tree ferns and palm ferns that date back to primeval times. Laurel trees and dragon trees can be seen in the Mediterranean House and the Large and Small Tropical Houses are home to tropical rainforest flora originally found in Asia, Africa and the Americas. During the summer visitors can enjoy the courtyard with its citrus trees, palms and a cactus garden.